Listen here to sample the music of Sundae & Mr. Goessl, who will be bringing their delightful musical style of vintage pop to Eleven Winery on Saturday, February 20th. 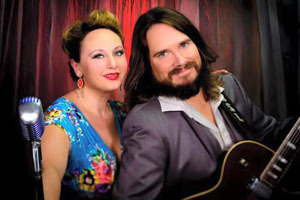 Come hear this husband/wife duo play original tunes and favorites from the 1930’s through the 60’s in the intimate tasting room of Eleven Winery on Day Road. Kate Voss, known as Sundae on stage, has been nominated for 2015 Vocalist of the Year by Earshot Magazine. She and husband Jason Goessl formed a deep connection through their love of music and became a couple. In this podcast they perform “Makes My Heart Sway”, an original composition from their album to be released this spring. Sundae & Mr. Goessl perform at Eleven Winery, 7671 NE Day Rd, on Saturday, February 20th from 1-4pm; there’s no charge for admission. For more information about Sundae & Mr. Goessl visit http://www.sundaeandmrgoessl.com. For more information about Eleven Winery’s regularly scheduled concerts visit www.elevenwinery.com or call 206-780-0905. Credits: BCB host: Sandy Schubach; BCB audio editor: Chris Walker; social media publisher: Diane Walker.